Curly French Fries with Cheese. Jalapeno Poppers With cream cheese or chedder. Margherita Topped with fresh mozzarella cheese & basil. Bianca Pizza (no tomato sauce) With olive oil, mozzarella cheese& fresh garlic. With broccoli, garlic & fresh tomatoes on a bianca pizza. B.L.T With mayonnaise, bacon, lettuce & tomatoes on abianca pizza. Dominicks Special Our traditional pizza with bacon, black olives,green peppers, meatballs, mushrooms, onions,sausage & pepperoni. Arugula Grape tomatoes & parmesan cheese. Tre Colore An olive oil pizza topped with pesto & sun-driedtomatoes. Vinny's Special. A traditional pizza topped with fresh mushrooms,onions & marinated roasted red peppers. Hawaiian A traditional pizza topped with ham & pineapple. Italian Delight A traditional pizza topped with prosciutto & sauteedsweet garlic cloves. 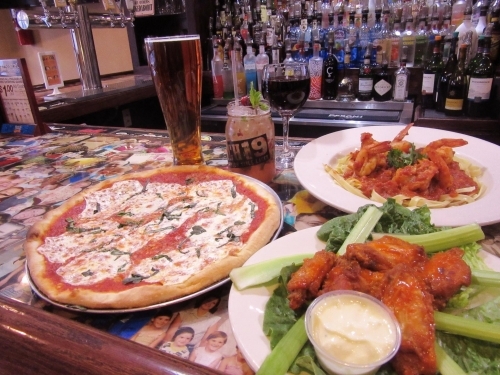 Shrimp Marinara A traditional pizza topped with marinara sauce &shrimp sauteed with garlic. Ricotta Spinach Primavera With spinach, garlic & fresh tomatoes on a bianca pizza. Thick Crust Square. Please Allow At Least 40 Minutes Of Prep Time. Brooklyn Style (Large Only) . Thin crust square, chunky tomatoes, fresh mozzarella cheese, regular Mozzarella, basil& olive oil. Webster Brooklyn Traditional Brooklyn style topped with eggplant. Thick Crust Round. Please allow at least 40 minutes of preparation time. Red Foccacia With tomatoes, onion & rosemary. Honey Mustard Chicken Chicken fingers,roasted red peppers, hot peppers, bacon, tomatoes& honey mustard dressing topped with mozzarellacheese. Baked Ziti I Our delicious baked ziti topped withmozzarella cheese. Chicken Vodka Grilled chicken tossed with ourvodka sauce & topped with mozzarella cheese. Chicken Broccoli Alfredo Grilled chicken,broccoli & our alfredo sauce topped withmozzarella cheese. Carini Specialty Pan pizza with fresh mozzarella,fresh spinach, parmesan, oregano & extra chunkytomato sauce. Cheeseburger Supreme Ground beef, lettuce,tomato, pickles, American cheese & Russiandressing. Baked Potato Sliced potatoes topped withmozzarella cheese, cheddar cheese & bacon. Chicken Maria Grilled Chicken, roasted redpeppers, spinach, in a white wine butter saucetopped with provolone cheese. Chicken Bacon Chipotle Ranch Grilled chicken, bacon, chipotle ranch dressing,lettuce, tomatoes & mozzarella cheese. Cheesesteak with The Works Mushrooms, fried onions, sauce, green peppers& mozzarella cheese. Buffalo Chicken Strombolli Buffalo Chicken Stromboli. With American cheese, lettuce, tomato & onion. Chicken Cheesesteak Hoagie Wrap With American cheese, lettuce, tomato & onion. Grilled Veggie Wrap Roasted red peppers, onions, spinach, mushrooms, broccoli & green peppers. Grilled Chicken & Veggie Wrap Grilled chicken tossed with roasted red peppers, onions, spinach, mushrooms, broccoli & green peppers. Buffalo Wrap Chicken steak with American cheese, our buffalo sauce, lettuce & red onions. Chicken Bacon Ranch Wrap Grilled chicken, bacon, ranch, romaine & diced tomatoes. A Sandwich Filled with Italian Favorites & then Hot Pressed to form an Amazing Creation! Nancy's Favorite Prosciutto, fresh mozzarella, roasted red peppers, basil, olive oil & a drizzle of balsamic vinegar. All Seafood Entrees Served with a Side of Spaghetti, Homemade Rolls & Parmesan Cheese. Shrimp Scampi Jumbo shrimp sauteed with garlic in a lemon butter sauce over spaghetti. Chicken Piccata Served with capers in a lemon sauce. Chicken Griglia Chicken Griglia (Heart Healthy). Grilled chicken breast served with a side of mixed vegetables. Chicken Arrabiatta Served with black olives & roasted red peppers in a spicy marinara sauce. Cannoli Buy 3 get 1 free! In 1962, 12 year old Vincent Scavo arrived in New York City from Carini, Sicily with his family in search of the "Great American Dream". By the age of 16, Vinny had started working with his older brother Dominick making pizzas in Prospect Park, Brooklyn. Vinny and Dominick, along with their cousin Sal, went to New Jersey and opened several pizzerias in Clinton, Somerville, Newton, Flemington and Ewing. In 1972, Vinny married Nancy and they started their family. Two years later, in 1974, Vinny opened his own Dominicks Pizza Shoppe in Washington Crossing, Pennsylvania. 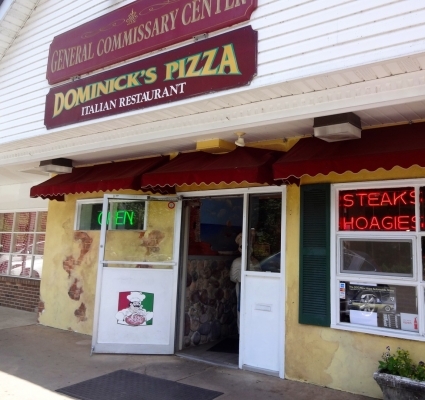 Over the next thirty years, Vinny continued to share his love of food and pizza with the community by opening several new locations in Richboro, Morrisville and Langhorne, all bearing the name Original Dominicks Pizza. 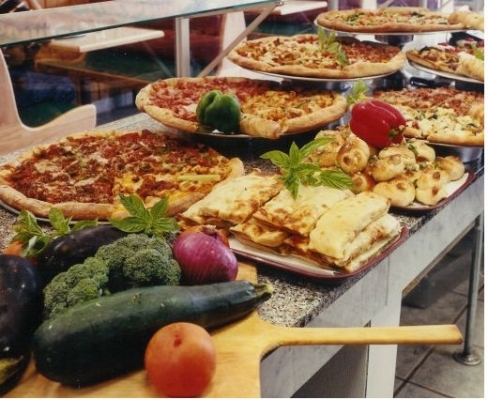 Vinny believed that his success was due to his dedicated customers who love his original pizza recipes, his family and his hard working staff who take pride in their work. 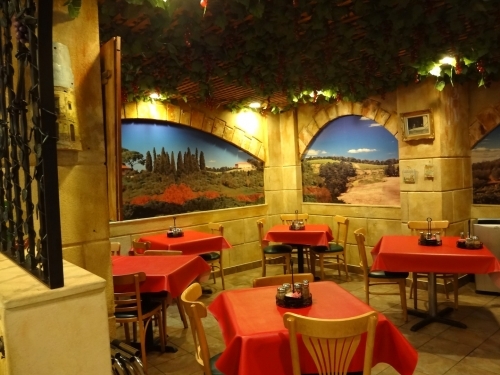 His wife and children can still be found in his pizza shoppes, continuing Vinnys legacy of providing the local community with a place to relax and come together, while enjoying some of the best pizza and Italian dishes around.